Sukhdi is a very famous Gujarati sweet, made in almost all home in Gujarat. It is also known as Gud Papdi. Gud means jaggery. Sukhdi is made from whole wheat flour, jaggery and ghee. Grated cashews and almonds can also be added. It is mostly consumed in winter. It is good for health also. Here is the very simple and easy to make recipe. You can store this in airtight container for 10-15 days. 1. Grate jaggery in bowl. 2. Spread 1 ts ghee in flat round plate. 3. Heat pan, add ghee. 5. Add whole wheat flour, stir continuously. 6. Cook till flour come light pink color. 8. Add jaggery and mix well. 9. Immediately remove in plate and spread properly. 10. Use flat bottom small bowl to spread evenly. 11. Cashews or almonds can be added now. 12. Cut in square or diamond shape with the help of knife. 13. Let it comes at room temperature. 14. 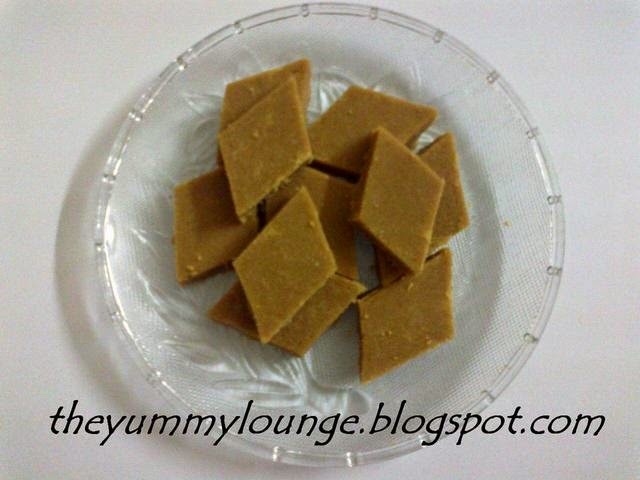 Delicious Gujarati Sweet SUKHDI is ready eat. You can serve it in morning with breakfast or with evening snacks also.